This is open to children ages 4 (by 12/01/19) through those entering 6th grade. This program begins each morning with an Opening which consists of music, a skit or video and announcements. Each group will then rotate through our six stations: Crafts, Bible Lesson, Application, Recreation, Snack and Music. We end by joining together for a Closing before dismissal. *We also will be having a Closing Program Friday evening, August 9th at 7:00pm. We invite family and friends to join us as the children share what they have learned during the week. If you are new to our VBS program, this is a great way to learn more about the program and the staff who run it. We hope to see you there!! We do have a limit of 200 children. If registration is full, we will contact you and place your name on a waiting list. In the event of an opening, we will be sure to let you know. 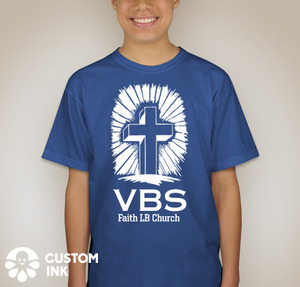 We have VBS t-shirts available for purchase through CustomInk! They will be handed out on the first day of VBS, or you can pay to have them shipped directly to you. They are not required, but are fun for our group color day! Cost of VBS T-shirts is $15.27. You can now order your shirt online! Be sure to double check sizing and color before you finalize your purchase. If you have any questions, contact Tami Sunwall through the VBS email. To order your shirt, please click here! for those entering 7th grade through those who just graduated 12th grade in 2019. To register for our Teen Program, please click here. *If you are volunteering on staff, you do NOT need to register separately for our teen program. We are always excited to have people help out with our VBS program. Please join us! To visit our Staff Homepage, please click here. It will have all you need to know about being on Staff as well as links to register to volunteer. If you cannot be there to help the week of VBS but would still like to be a part of this program, check out the staff registration form for some ideas or send us an email, which is listed below! If you have any questions, feel free to contact the church office (914) 769-9390.